For the purpose of the company that the employee works for, he or she may have to travel. For this the employee is paid a certain fixed amount of money which is called travel allowance. Apart from this, travel allowance may also refer to the expense incurred by the employees in travelling from his or her residence to the place of work. In both cases, the money may be paid prior to the travel or after the travel. Private companies have their own policies for travel allowance. And for the government employees the government has its rules mentioned and modifies it from time to time. For being eligible for Leave Travel Allowance or LTA there are a certain conditions that the employee needs to fulfill. The employee should have official taken leave for the purpose of travel. And apart from this, the employee can apply for the travel allowance benefits if the travel is in the domestic level and not foreign. Also for availing travel allowance for your family, the employee needs to travel along with his or her family to avail the benefits. The term ‘family’ includes spouse, children, parents, brothers, and sisters; provided the bother and sisters are dependent on the employee. The Finance ministry passed an order saying that all the government officials who have to travel by air have to submit their boarding pass along with TA bills to avail the travel allowance benefits. Depending upon the grade in which employee works and accommodated city, travel allowance will get varied. The Threshold limit set by government of India for travel allowances ranges from Rs.400 to Rs.3200. Special calculations carried out for physically disabled person. For the central government employees, the reimbursement of the travel expense on rail, air, sea, bus, car, public car, taxi, or private vehicles would depend on the grade pay of the employee. And similarly the mode of transport that is availed by the employee for which the travel allowance with be considered will also depend on the grade pay of the employee. Just like other central government employees, the reimbursement of the travel expense of the employee would depend on the grade pay of the railway employee. They also need to provide proper proof of their travel along with their travel bills. In near past, travel allowance exemption from tax has been increased to Rs.1600 from its previous amount of Rs.800 by finance ministry of India, which widely welcomed by experts from all over the India. Similarly, tax exemption for disabled person too doubled to Rs.3200 per month. The travel allowance bill will be available in all the government office; apart from that you can also get a copy of it online. You need to fill in the required details and submit it with proper proof. 1 What is Travel Allowance? 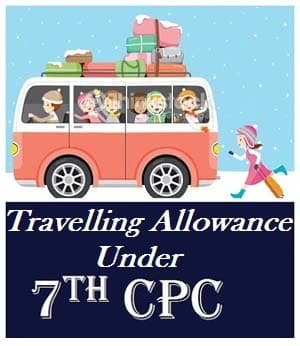 Travel allowance is a pay given by the employers to their employees in order to cover the disbursals which are occurred during their official journey or Journey carried out as per the norms of working company. 2 Who and When should one claim Travel Allowance? Travel allowance can be claimed by the employee and for his or her own family members who are listed in the company’s profile. Similarly, Travel allowance can be claimed only for the travels which are done by applying leave properly. 3 Where and How many times one can claim Travel Allowance? In most concern, they allow their employees to travel anywhere within India. However there are exceptions in the lists few companies do allow their employees to travel outside the country. Meanwhile, employees can choose the mode to travel either by Air, Rail or by road. And when it comes to limitations, employers have their own claiming limits according to their company rules. 4 Whether TA can be claimed for travel carried without claiming person? No! That’s not possible, Claiming person should be onboard while traveling in order to claim travel allowance. 5 Is there any maximum limits by which an employee should claim? Yes! Every companies has their own maximum limits, they allow their employees to avail allowances up to that limits. Beyond that amount, employees must take care on their own.